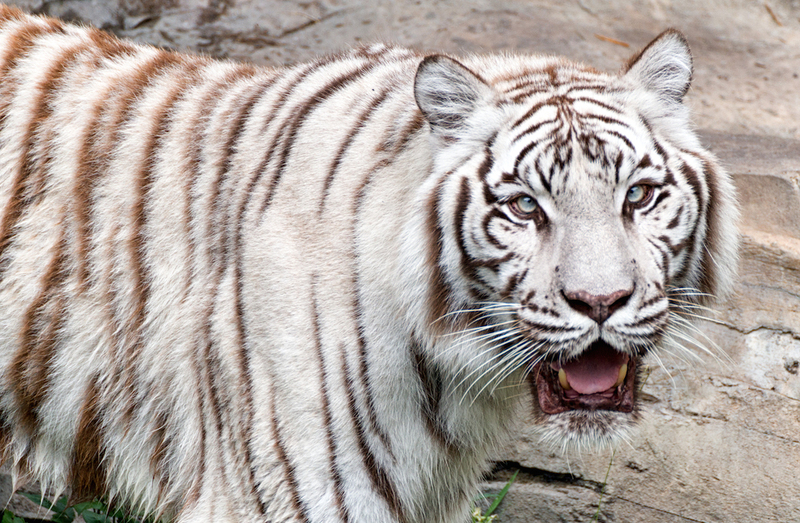 This week’s SATURDAY SIX takes a look at Six Reasons You Need to Check Out Busch Gardens Tampa. While we are generally focused on Walt Disney World and the Universal Orlando Resort, we often need to take a quick break and remind everyone that there are a lot of other incredible things to do while in Orlando on your family vacation. They say a rising tide raises all boats, and with both WDW and Universal doing record business Orlando is booming with companies trying to get a slice of the tourist pie. Stalwart parks such as Gatorland and SeaWorld are staples of Central Florida, and you’ve probably seen publicity for some of the new kids on the block including the Orlando Eye and SEA LIFE aquarium. There’s also attractions not far away from O-Town that are well worth your time and money including Legoland in Winter Haven and the Kennedy Space Center near Port Canaveral. There is a reason Disney built Animal Kingdom, and it was because it wanted to keep people on WDW property instead of driving to Busch Gardens. 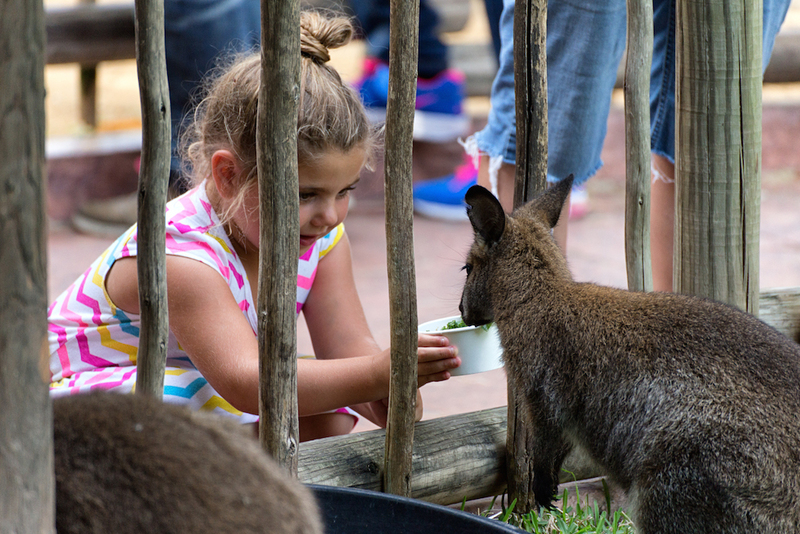 For both parks, being able to see and interact with exotic animals is a big selling point. 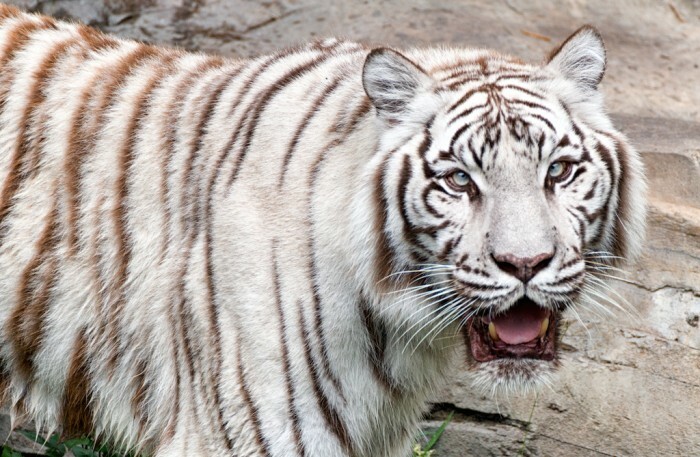 While Animal Kingdom has upwards of 2,000 animals, Busch Gardens Tampa has over 12,000. Elephants, cheetahs, gorillas, rhinos, and giraffes are the headliners but there are hundreds of species throughout the park. 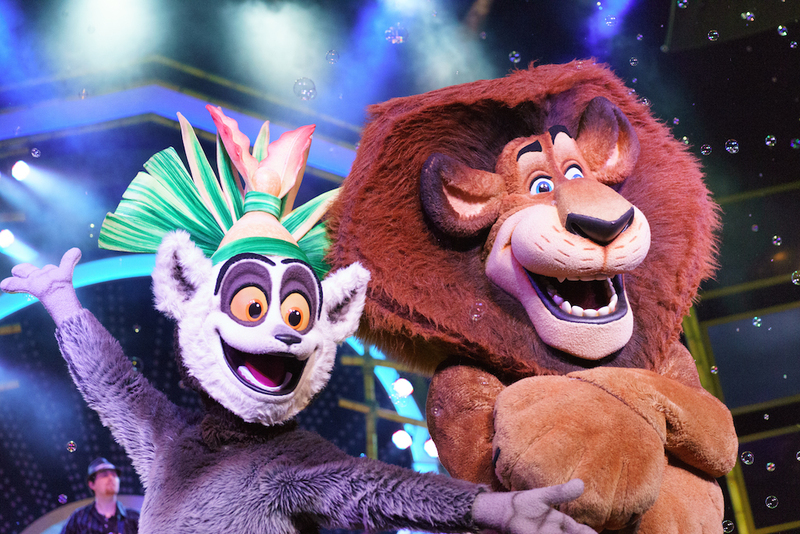 Not only are there much more animals, in general you are also going to be closer to them than at Animal Kingdom, getting a more intimate experience. Unique dining is becoming a bigger and bigger part of the theme park experience. Whether it’s a Dole Whip and Mickey Bar at the Magic Kingdom or a Butterbeer and Brain Freezin’ D’oh-nut Sundae at Universal, we all have that signature snack we look forward to on every trip. 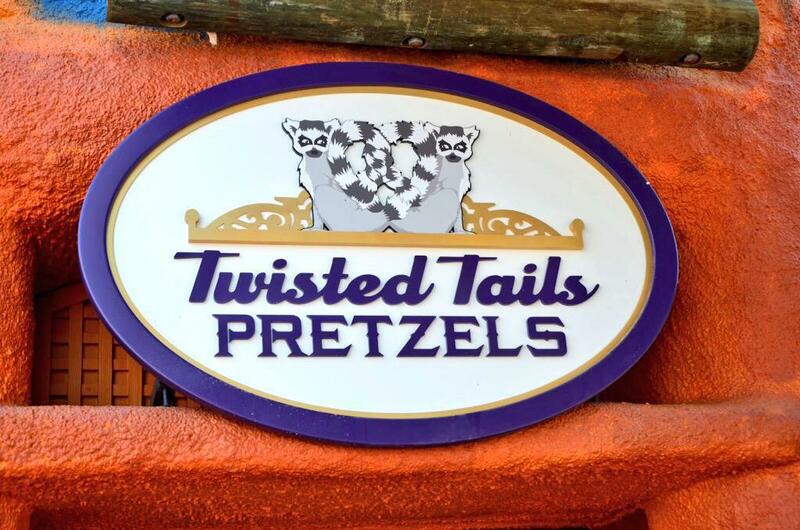 Busch Gardens has their own must do snack with the Twisted Pretzels at Twisted Tails Pretzels in Pantopia. 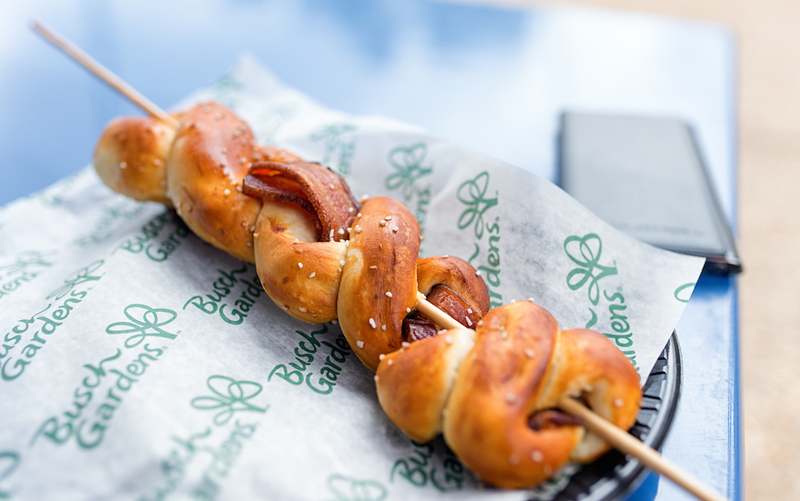 While you can’t go wrong with the ham & cheese pretzel or the pizza pretzel, the main draw is the Bacon Pretzel Fury. Let’s face it, pretzels are the new frozen yogurt and their popularity is growing at a rapid rate. The Bacon Pretzel Fury may be the king of the pretzel hill, it’s that good. 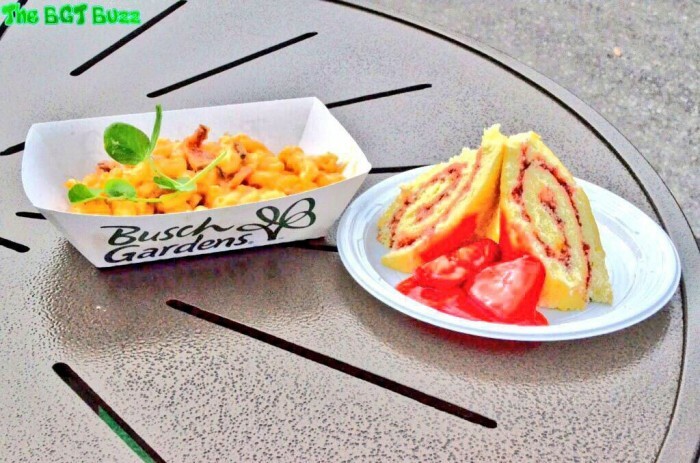 # 4 – Busch Gardens has their own Food & Wine Festival! No one is a bigger fan of Epcot’s Food & Wine Festival than us, and nothing fills our hearts (or stomachs) more than seeing others take a page from that playbook. The Food & Wine Classic at Disney’s Swan & Dolphin along with SeaWorld’s Bands, Brews, and BBQ are wonderful and we are considering getting a petition started at Change.org in order to convince Universal to get in on the action. 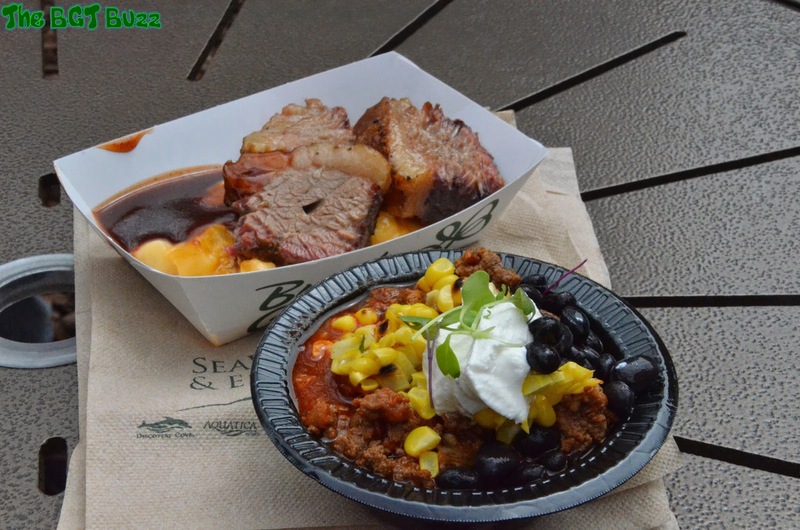 Busch Gardens Food & Wine Festival has everything we all love about Epcot’s Festival. Live concerts, over 100 wine and beer selections, and appetizer sized food items that will have your mouth watering. Like Epcot, Busch Gardens Food & Wine Festival is included with your paid park admission, so keep it in mind if you are vacationing in the spring. For a great recap of this year’s event, check out this report from The BGTBuzz. While its world class coasters get the majority of headlines, Busch Gardens has a lot of stuff for the younger set as well, including two extremely popular franchises in Madagascar and Sesame Street. The four Madagascar films (this includes the Penguins of Madagascar movie from last year) have earned a worldwide box office of over 2 1/4 Billion dollars. That’s right, Billion. We’re in Frozen territory here and it’s bewildering that Universal does not have this brand in their parks as kids love it. Meanwhile Sesame Street is the name in children’s entertainment that parents can trust. 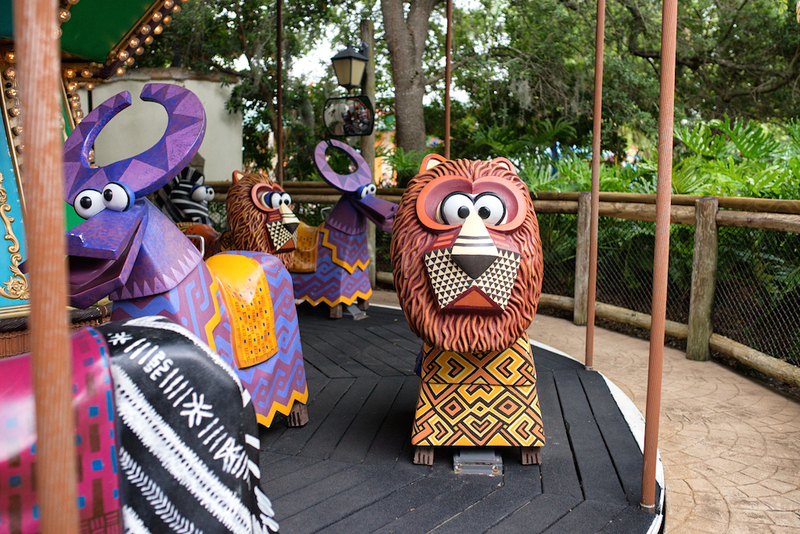 The Sesame Street Safari of Fun area of Busch Gardens is right up there with Seuss Landing at Islands of Adventure and Storybook Circus at Magic Kingdom as a place you are going to have to physically drag your kid away from. Rides, shows, and play areas will keep them content for hours. While there are parts of Universal’s Halloween Horror Nights that no one can compete with (for our money, Bill & Ted’s Excellent Halloween Adventure is THE best show in Florida every year) we actually had an overall better time at Busch Gardens Howl-O-Scream last year. 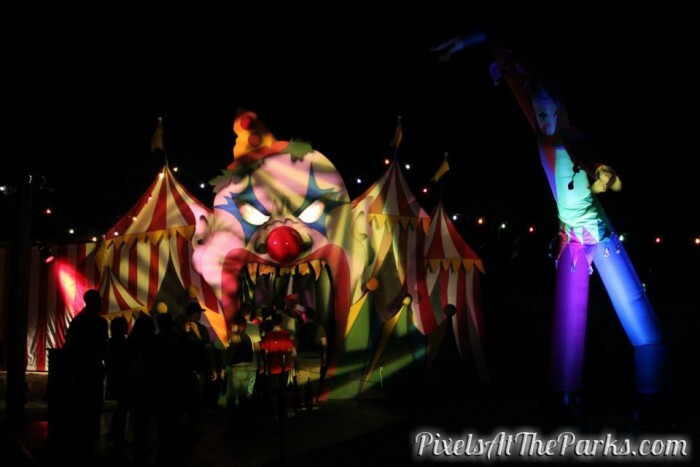 Similar to HHN, Howl-O-Scream mixes in haunted house experiences, with roaming scareactors, and live shows. While HHN is moving more and more into the direction of intellectual properties (The Walking Dead, Resident Evil, and American Werewolf in London), Howl-O-Scream is based more on original concepts. There are pros and cons to each method, but the creative minds at Busch Gardens can hang with anyone when it comes to developing unique houses. 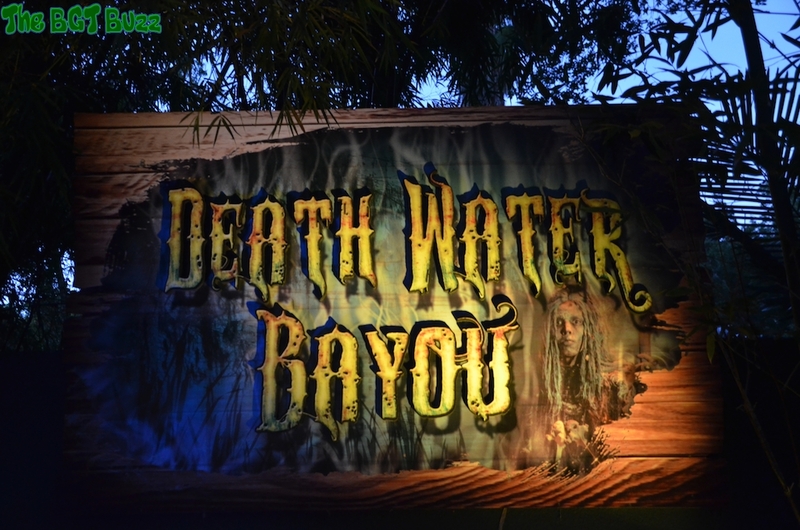 Last year, Death Water Bayou was one of the best houses I have ever been to, anywhere. The set design inside was incredible, but the entire experience was taken to an “11” with unbelievable great scareactors themed to the house interacting with guests queued up to go in. HHN has almost become a victim of its own success, with large crowds hurting the overall experience for the individual (although gate-bursting crowds is a problem any theme park on Earth – including Busch Gardens – would love to say is a “problem.”) While many times at HHN guests can feel like they are being herded in a congo line through the house, Howl-O-Scream gives them more time to explore along with space for the house’s scareactors to scare the bejesus out of you. # 1 – The Thrill Rides! 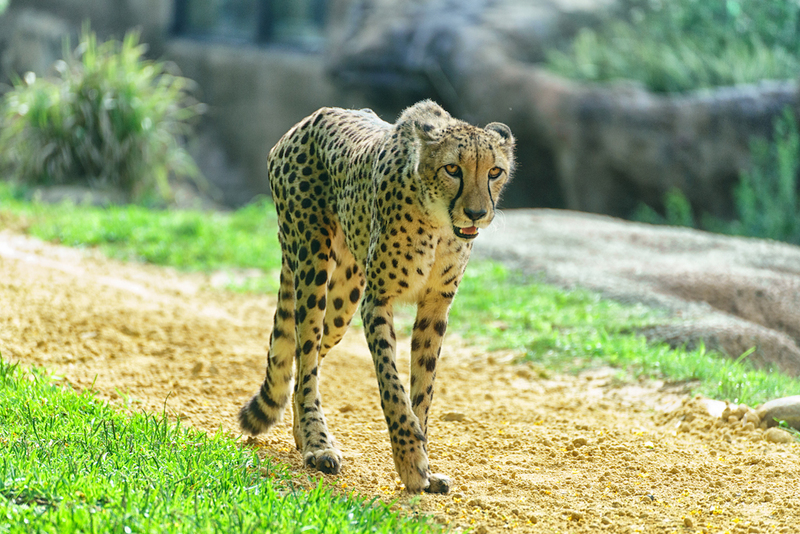 This is where Busch Gardens completely separates itself from Animal Kingdom, as the park is one of the absolute best places to go in Florida if you are a thrill ride junkie. 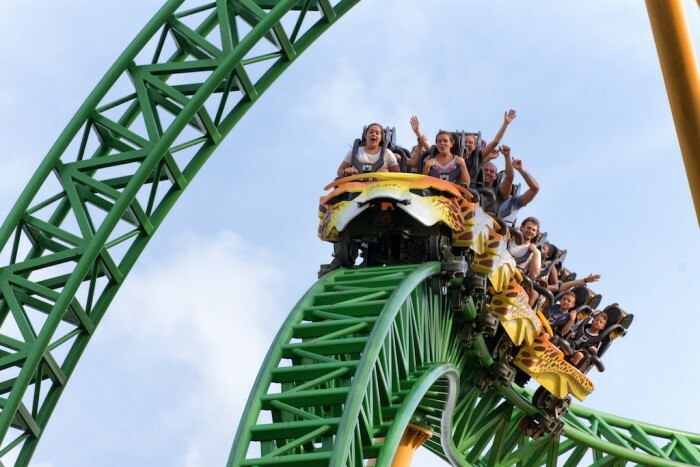 Cheetah Hunt is an exhilarating coaster that incredibly simulates the speed of a cheetah running. 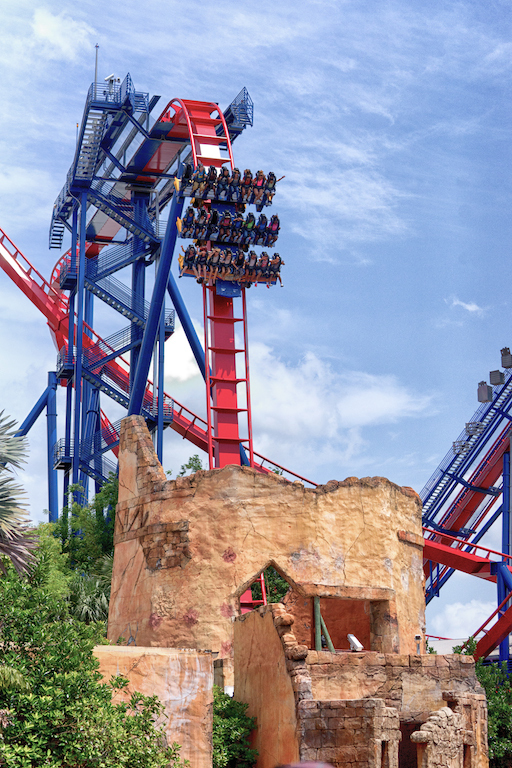 Meanwhile SheiKra is an imposing floorless-dive coaster that has an insane 200 foot drop. 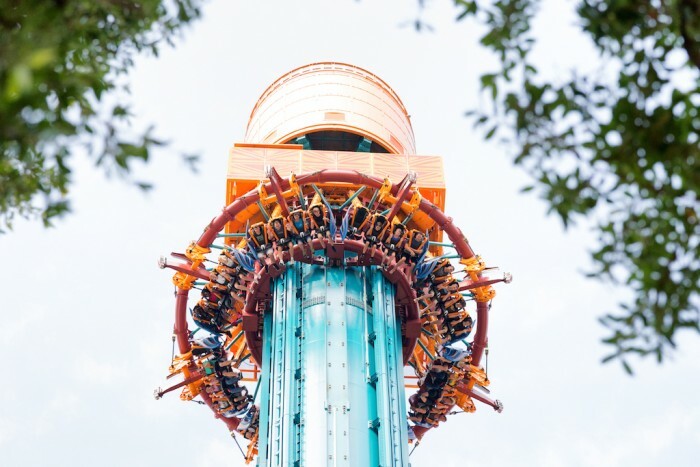 The newest attraction, Falcon’s Fury, slowly pulls you up over 300 feet and then rotates the seat so you are face-down for the drop, essentially making Tower of Terror as scary as Dumbo. While those are the main events, you can’t go wrong with Montu, Kumba or Scorpion coasters either. While it’s a different type of thrill, for those of you who miss the Skyway at Magic Kingdom, Busch Gardens even has a Skyride of their own that will have you high-in-sky as you traverse the park. 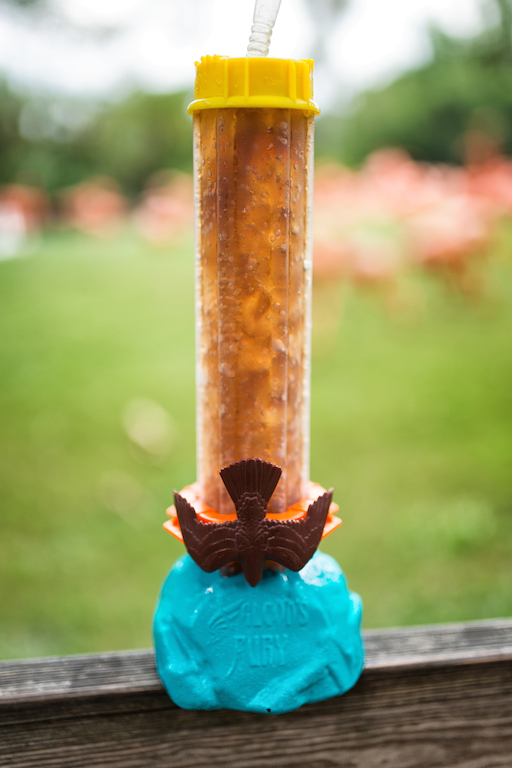 We consider ourselves connoisseurs of theme park collectible cups, and Busch Gardens has one of the most original with its Falcon’s Fury offering. Not only does it echo the visual look of the attraction, but it actually has a large falcon that can go up and down the cup. Brilliant! So there you have it: Six Reasons to Check Out Busch Gardens Tampa. Disney has changed the game in terms of vacationing in Florida, with their Magical Express (not to mention Disney Vacation Club) having many guests stay completely on property, year after year. As good as WDW is though, places like Busch Gardens are worth the drive even if staying on-site at Disney for a week. Special Thanks to crack staff photographer Brandon Glover, photo wunderkind Mike Sperduto, Jay from Pixels at the Parks, Viktor from The BGT Buzz, and Megan Stump for their invaluable assistance with this article. It may take a village to raise a child, but it takes an entire country to get one of these articles done. Be sure to also check out Brandon on The Park Blogger podcast with co-hosts Aengus Mackenzie and Brian Carey. I’d like to see a series of Touring Plans themed collectible cups. How do you see the “Derek Burgan”cup? I see they have a “Quick Queue” thing, which I assume is similar to Universal’s Express Pass? How does it work, do many people use it, and do you even need it?